Property division is a necessary step in divorce. If you have assets you own jointly with your spouse, to which that you or your children are especially attached, buying your spouse out of her share during settlement negotiations may allow you to keep them. Normally, the highest value asset in connection with a spousal buy out is the marital residence. If you and your spouse can't agree on how to handle it in the property settlement agreement, the judge can order it sold and the proceeds split equally between you. If your spouse agrees to a buy out, however, some research can help you decide if you can afford to keep the house before you commit to it in the property settlement agreement. Appraise the home and calculate the share of equity each of you owns. You may calculate the home's equity, then subtract the amount left to pay on your existing mortgage loan from the appraised value as of the date of separation. If 100 percent of the home's value is marital property, each of you own exactly half the equity. This means that the value of half the equity is the amount you may agree to pay your spouse to buy her out. Once you know the amount necessary to buy out your spouse, there are two ways you can go about it. You can either buy her out in cash, or offer her additional marital assets worth the buy out amount. If the decision is a cash payment, you may need to add the buy out amount to your mortgage application. Generally speaking, keep your monthly mortgage, property taxes and homeowner's insurance payment below 28 percent of your gross monthly income. Once you know the amount you need to borrow to refinance the house, you can calculate the approximate monthly payment and decide if keeping the home is financially feasible. Qualifying on your own for a mortgage, especially if you are adding the amount necessary to buy out your spouse, may not be easy. However, refinancing is sometimes necessary to release your spouse from the existing mortgage debt. In turn, your spouse will have to relinquish ownership rights by signing papers that remove her name from the property deed. The terms of the buy out may be incorporated into the property settlement agreement for both spouse's protection. The agreement may specify which spouse is buying out the other, the dollar amount and by what method. It may specify that the spouse keeping the house must refinance to remove the other from the mortgage debt and give a date by which he must close on the new mortgage loan. Deadlines also may be given for the spouses to file the new property deed with the county recorder's office. Divorce Net: Refinancing or Buying Out Your Spouse: Insights from a Mortgage Lender, Lina Guillen, Esq. Lawyers: Will the House Have to be Sold if You're Divorcing? 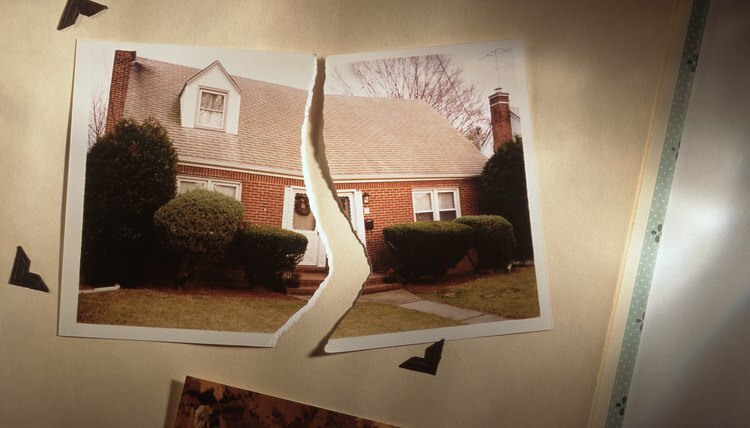 For many divorcing couples, their home is the biggest asset to be split -- and the biggest debt. Even spouses who can agree on how to divide the home often struggle with putting their plan in place because lenders get a say in what happens, too. It is relatively simple to remove your name from the title to the property, but you will have to deal with your lender to get released from the mortgage as well.